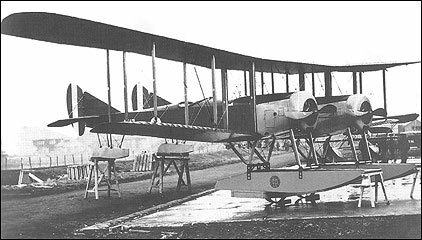 Technically a fighter, the Blackburn TB was one of the most specialized aircraft ever built - a long-range twin-engined anti-Zeppelin floatplane. This was Blackburn's first twin-engined aircraft (TB stood for Twin Blackburn), but more resembled the collision of two single-engined types. In fact, the rear fuselages and tails came from the BE.2c, then being licence-produced by Blackburn. Designed for a pair of 150hp Smith radial engines, the TB wound up with units giving a third less power. Its war load was only 32kg of steel incendiary darts. The TB's attack method was to climb above enemy airships where the observer would fling the darts at them in the hope of causing and igniting a fatal gas leak. The TB had no other armament, but it was unlikely to get within gun range of a Zeppelin, let alone above one. Among the problems with this airplane was that there was too much flexing between the two fuselages, as well as in the control cable runs, which made it difficult for the pilot to maintain control. Also, starting the engines was awkward, to say the least. The observer had to stand on the floats while the engines were started. The rotary engines often spilled gasoline onto the floats, which could then catch fire, so the observer also had to bring a fire extinguisher with him while he started the engines. � The TB's structure flexed in flight, moving the two fuselages relative to each other and slackening the aileron cables, giving poor lateral control. Aileron inputs in one direction warped the wing, causing movement in die opposite direction. � The TB had two main floats, one under each fuselage, and auxiliary floats under each tail. Priming the engines caused fuel to drip on the floats, which usually caught fire on engine start. � The observer and pilot could only communicate by hand signals due to the great distance between their cockpits. � The last TB had 110hp Clerget engines, but this did little to cure the performance problems.